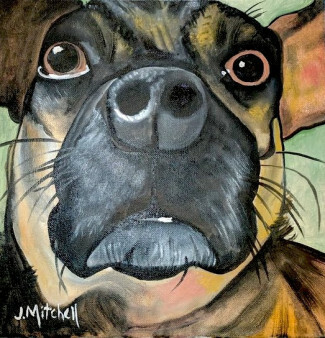 Turns out that POZ blogger Joyce Mitchell, president of Capital City AIDS Fund (CCAF), is much more than an advocate and journalist—she’s an artist too! And you can nab one of her oil-on-canvas works right now at the HIV fundraiser Art from the Heart. But don’t delay: the auction ends at 11:45 pm, Saturday, September 29, Pacific standard time. Mitchell and over 25 other artists have donated their work to raise funds for CCAF’s Helen Veress-Mitchell Scholarship Fund that helps out HIV-positive youth. Works will be on view this Saturday, Sept 29, at Apothic Heart Tattoo in Sacramento, California, where you can also meet the artists and mingle. But you don’t have to be in Sacramento to score some original art. Visit 32auctions.com to view the show and place a bid or buy and item. For those of you not in the market for new artwork, check out the other items up for auction, including a raffle for a Kiehl’s Skin Care Anti Aging Gift Box and a framed Steph Curry autographed jersey (with certificate of authenticity). And to learn more about Mitchell’s HIV advocacy work with Capital City AIDS Fund, check out her POZ blog here.